Both the ASOR Annual National Conference and DORS (the Defence OR Symposium) will be part of the MODSIM conference again in 2019, which is being held in Canberra. We are very grateful to MSSANZ for inviting us to once again be part of their major event. The ASOR-DORS-MODSIM organising committee is finalizing the conference streams and sessions. ASOR and DORS will be captured within one joint stream in 2019, rather than two parallel ones. We are doing this so that the interaction between the two communities is maximised, and our sessions (within the stream) have the best selection of submissions from across ASOR and DORS. The call-for-papers for MODSIM 2019 will be issued within a few weeks. The ASOR Melbourne Chapter's AGM will be held on 27 March 2019, in the Data61 Docklands Demo Room, 710 Collins St, Docklands. The AGM will commence at 5pm and be followed at 5.30pm by a seminar. ASOR will provide refreshments and we do hope to see a good number of members attend this event. More information about this event will follow during March. The ASOR-DORS 2018 Conference in Melbourne (4-6 December) was a major success. The conference attracted 260 delegates, making it the biggest OR national conference in a very long time indeed. Although our registration fee for the three day conference was quite low, we managed to keep in the finances in the black because of the high attendance. Many people contributed to the success of the conference, but special mention must be made to our student volunteers who helped out at the registration desk. An editorial panel headed by Andreas Ernst is completing the necessary work for the conference proceedings (of the full papers). The finished product will be delivered to Springer in late March, and delegates will receive their electronic copies later in 2019. In the meantime, the book of abstracts (which was distributed at the conference) is available on the conference website. ASOR is once again joining with Risklab and Data61 to present Sci+Tech in the City, from Data61's facility in Docklands. This year we are also coupling-up with CSIRO Alumni in some of our events. Registration (free) is essential because we consistently reach the venue's capacity, and registration is via EventBrite - see the website https://research.csiro.au/risklab/scitech-in-the-city/ for further details. Our first four events are: Automation and Machine Vision (21 February, sold out); Analytics for the Public Sector (7 March); Medtech Innovation (21 March); and Scientific AI (4 April). Biarri are currently advertising a Senior Operations Research Engineer position within their Biarri Rail business. The role centres on designing, developing, and applying algorithms, mathematical models, simulation and heuristic models to build planning and scheduling solutions for railways. See http://biarrirail.com/careers/senior-operations-research-engineer/ for information. We have two ASOR workshops scheduled for 6 December. The morning workshop is on Real Options + OR and the afternoon workshop is on Last Mile Logistics. The Real Options + OR workshop is being run by Geoffrey Lee from Data61, and features presentations, a panel session, and audience participation. Presenters include Margaret Armstrong, Professor at EMAp Fundacao Getulio Vargas and formerly Professor at Ecole des Mines de Paris, who will talk about using Real Options in a mining context. Registration for this workshop will open during November. The Last Mile Logistics workshop is co-hosted by the conference, Sci+Tech in the City, and the Supply Chain and Logistics Association of Australia. The centrepiece of the workshop is a 90 minute presentation and tutorial by Prof. Don Ratliffe (Georgia Tech), and we have a series of panels, discussions and audience participation set up for the second half of the workshop. Registration is now open and is required of conference delegates as well as other guests. ASOR and Data61 continue to team up to host Sci+Tech in the City every second Thursday in Melbourne, and two recent optimisation-focused instalments of S+TitC have been great successes. On 23 August 2018 the topic was HEALTH ANALYTICS AND OPTIMISATION and Leonid Churilov (University of Melbourne) gave possibly the best received Sci+Tech in the City presentation this year, talking mainly about stroke response. Vicky Mak (Deakin University) and Rajiv Jayasena (CSIRO AeHRC) also made great contributions to this excellent day. On 11 October 2018 the topic was OPTIMISATION, with a spotlight on infrastructure, matching and decision support. Our speakers were Keith Joshi (Biarri Commercial Mathematics), Semini Wijekoon (Monash University), Hansani Weeratunge (Melbourne University) and Emil Mittag (AI and ML Engineer at Orchestrated). Sci+Tech in the City has two more 2018 events: 1 November on Manufacturing and Industry4.0, and 15 November on Analytics in the Public Sector. We're then going to start planning the 2019 series, and welcome expressions of interest from potential speakers, or suggestions of topics that ASOR members might be interested in. This year the BAM Conference will be bringing together innovators, scholars and thinkers to focus on ‘Invisible Intelligence’ and through expert presentations, lightning talks and panel discussions demonstrate how we are using optimisation and mathematics behind the scenes to keep our world moving. So basically it will allow a broad set of topics to be presented, each looking at how mathematics powers the real world around us, behind the scenes. The format of the conference will be over two days on the 20th and 21st of November. The 20th of November will be the academia day with talks from leaders in academia discussing the latest applications of their research. The 21st will be the industry day with speakers invited from Amazon, CBA, BHP, etc. Registration is via the BAM Conference Website. On Thursday 16 of August Jeremy Flagel and Laurine Rabusson presented a seminar on CSIRO Data61 Demo Lab in Melbourne's Collins St. This was a joint event between ASOR and the Clojure Melbourne Users Group, clj-melb. Jeremy and Laurine are visiting students from ISIMA (Institut Superieur d'Informatique, de Modalisation et de leurs Applications), who were placed in Data61 as Industrial Trainees. In the seminar, titled "Decision Making under Uncertainty in a Clojure Platform", Jeremy and Laurine presented their work on the development of an algorithm and platform to optimise under uncertainty, in order to provide robust, reliable operation plans of agricultural supply chains. They are developing and extending a two-stage stochastic optimisation model, which is represented mathematically as a finite set of scenarios. The software platform they are helping develop has been designed to facilitate unit testing, dimensional analysis, and preparation of documentation. 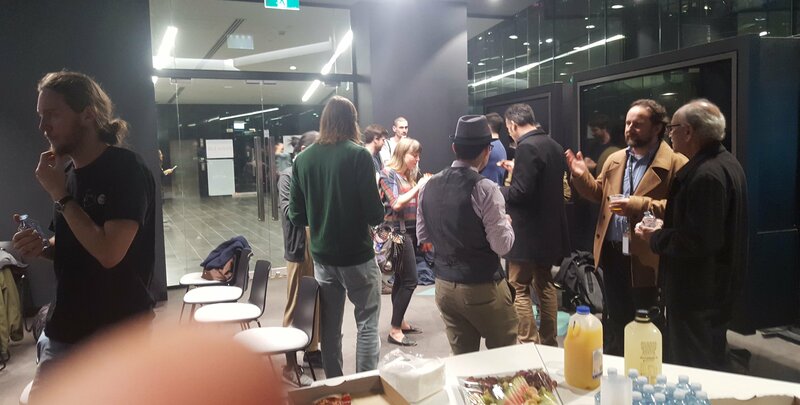 Before and after the event, chaired by James Sofra from clj-melb, the members of ASOR and the Clojure users group socialised and exchanged experiences on the practice of coding and optimisation over pizzas and drinks. The organising of the 2018 ASOR/DORS National Conference is in full swing. The conference website http://www.confer.nz/asor-dors2018/ is now live. The extended abstracts and the abstracts of full papers will be distributed and published on the ASOR website. The conference proceedings (full papers) will be published during 2019. ASOR is finalizing publication arrangements with Springer, which will see the full papers published in a second volume of Data and Decision Sciences in Action (the first volume resulted from our 2016 conference) and appear on the major literature indices. As indicated in ASOR News April/May 2018, ASOR will be awarding these in 2018. Submissions will open shortly: see ASOR Rising Star Award and ASOR Ren Potts Medal. Please consider nominating colleagues or peers for these awards which recognise excellence and engagement in Operations Research in Australia. In Melbourne, ASOR continues to be part of the Sci+Tech in the City meeting series.The well-established format of topical seminars (three or four ten minute talks each week) is continuing fortnightly between 26 July and 15 November. Registration is essential (due capacity) and is via eventbrite. See https://research.csiro.au/risklab/scitech-in-the-city/ for more details. A new Sci+Tech in the City event type, similar to a meetup, is being tried on 16 August. While the details are still being worked on, the idea is to bring together data science and optimisation practitioners to talk about the techniques, software libraries and tools which we find useful and worth sharing. For the pilot on 16 August the topic is on using text analytics to augment, explain and repair quantitative data series. ASOR is pleased to advise members of the Australian Mathematical Sciences Institute (AMSI) event AMSI Optimise, being held 18-22 June 2018 at the University of Melbourne. AMSI Optimise is an annual networking and research-training event that aims to strengthen mathematical optimisation research engagement and its applications across industry. General information, a call for submission of abstracts, and registration details can be found on the AMSI Website. This seminar series centred on Melbourne (Docklands) and co-hosted by Data61, ASOR and Risklab, is running fortnightly during 2018. Registration is free, and a small donation on the day to the Brotherhood of St Laurence David Sier Fellowship is encouraged. Sci+Tech in the City is held every second Thursday evenings from 5:00pm to 6:30pm, starting 12 April 2018, in the Data61 Demonstration Room at 710 Collins St Melbourne. At least three and sometimes four speakers each week present on selected topics within a theme, with the talks ranging from innovation stories, to showcases of science, to demonstrations of technology. ASOR's National Conference for 2018 will be held joint with the Defence OR Symposium (DORS), at Rydges Hotel Melbourne, 4-6 December 2018. ASOR 2018 / DORS 2018 is the 26th National Conference of the Australian Society of Operations Research. It will be held in Melbourne from 4 to 6 December 2018. The ASOR / DORS 2018 conference brings together research in optimisation, operations planning, informatics, operations research, defence, simulation and modelling of industrial operations, statistics and big data analytics. Further information can be found at ASOR Conferences. The ASOR Ren Potts Medal and ASOR Rising Star Award return in 2018. Applications will open in July 2018 and will close 28 September 2018, with the recipients announced at the ASOR/DORS 2018 Conference in December. The ASOR National Committee is presently seeking nominations for the awards selection panel, which in immediately past years has been chaired by Jerzy Filar and comprised of Jerzy, Hussein Abbass (as current National President) and Simon Dunstall (immediate past National President). ASOR is pleased to once again join with the MODSIM Conference, this time in Canberra, 1-6 December 2019. The announcement of the conference is at MODSIM 2019 on the MSSANZ website. ASOR and Data61 organised a 3-day Functional Programming (FP) workshop in CSIRO Parkville, 29-31 of January 2018. The course was given by Tony Morris from Data61 Functional Programming Lab and his team, who came from Fortitude Valley in Queensland to promote this alternative paradigm for computer programming among Melbourne optimisation and software development communities. The course was split in an introductory track and an applied FP track, both of which enjoyed full attendance. The course was clearly a success and required no prior experience with functional programming, whose concepts were illustrated using the Haskell computer language. Attendees came from diverse backgrounds, including academics, researchers at CSIRO and universities, freelancers, web developers and general public, many of which were registered after ASOR's mailing list invitation. The teaching method was dynamic, with a brief introduction of the concepts followed by hands-on exercises and the instructors roaming the room, willing to answer questions from the audience if needed. We expect that training activities like these will benefit the optimisation community by helping them develop simpler, less error-prone code to implement their research ideas and applications, and we hope this is the first of many such events. Andy Wong has indicated to ASOR National that he wishes to resign as ASOR webmaster. Andy has held down this role admirably for countless years. ASOR thanks Andy for his long-term contribution! Simon Dunstall / Data61 will be taking on full responsibility for the website from now on. We have a standing invitation for contributions, content, editors and/or site maintainers to help us keep things ticking over. Mark Wallace (Monash / Opturion) speaking at ASOR/Risklab/Data61's Sci+Tech in the City event on 3 May 2018. Other speakers on the night were Dhirendra Singh (RMIT) and Nicholas Davey (U. Melb). 1. **Introduction to Functional Programming**. This is the traditional workshop that has been run by Data61 for many years. This track is targeted toward people who have some basic programming experience, but little or no exposure to Functional Programming. 2. **Applied Functional Programming**. This is new course material that is targeted toward programmers who have become proficient with navigating Functional Programming concepts, and in particular, Haskell data structures. This course material involves writing a web application with a database backend. and requires no prior experience with functional programming. Each session will be instructed by team members of the QFPL and you will be using the Haskell programming language to help you along your path of FP discovery. The Applied FP track will also be instructed by QFPL team members. There is no cost but participants will be required to bring a suitable development machine (portable) for working through the exercises. You will also need to install the Glasgow Haskell Compiler (http://www.haskell.org/ghc/) version 7.8 or higher on that machine. The ASOR National Conference 2017 was held alongside the Defence OR Symposium (DORS) within the MODSIM conference at the Grand Chancellor Hotel on the waterfront in Hobart between 3 December and 8 December 2017. The ASOR/MODSIM/DORS conference had around 1000 delegates, including approximately 50 ASOR talks. ASOR members' OR contributions were in ASOR streams and well as DORS and the mainstream MODSIM sessions. An ASOR Invited Presentation was delivered by Rodolfo Garcia-Flores, on his experiences with Constraint Programming. The 2016 ASOR Ren Potts winner Leonid Churilov presented one of six plenary talks at the conference (on Thursday morning), and was insightful and entertaining in his talk titled The Art, Science, and Joy of Healthcare Modelling: being an important part of the effort to combat the world’s third biggest killer. He presented a broad perspective on past, present, and potential future of healthcare modelling that he has acquired from both ends of the “academic divide” over the last twenty-plus years. His special focus was on modelling work performed while contributing to the effort of combatting the world’s third biggest killer, which is stroke. The ASOR Annual General Meeting was held on Tuesday at 6pm, and an exchange of ideas about how to engage member was prominent in the discussion. For ASOR's major annual awards, we congratulate Peter Taylor on receiving the ASOR Ren Potts Medal for 2017, and Ali Eshragh (pictured above) for receiving the ASOR Rising Star Award for 2017. ASOR members nominated multiple high-quality candidates for both of these awards, and this kept the adjudicating panel of Jerzy Filar (chair), Hussein Abbas and Simon Dunstall on their toes. The awards were presented at the conference dinner on 7 December. The best student paper award went to Nigel Clay for Discrete time stochastic control for blood inventories. There were several other high-quality student papers/presentations. For the numerous ASOR members who attend it, the final session on Optimal Decisions under Uncertainty (stream J6) was a highlight and is hopefully indicative of the future, both in terms of who presented (mainly, several young researchers making substantial contributions to the field) and what was presented (whole-hearted and successful attempts at progressing non-deterministic optimisation and analytics). Presenters in this session included (left-to-right, top-to-bottom below) Nicolas Langrene, Monica Chen, Nicholas Davey and James Looker. ASOR again extends its thanks to MSSANZ for their great conference organisation work and for allowing us to co-locate in 2017. We are particularly indebted to the efforts of Julia Piantadosi, Karen Moobs and David Post. It was announced in Hobart that MODSIM 2019 will be held in Canberra, and ASOR has been invited to be part of the event once more. ASOR Melbourne will host this in December 2018. The organising committee at present consists of David Marlow, Rodolfo Garcia-Flores and Simon Dunstall. The 2016 ASOR National Conference will be hosted by the ASOR Canberra branch, will be joint with Defence OR Symposium (DORS), and will take place in Canberra on 16-17 November 2016. Further information is found at ASOR Conferences. ASOR gratefully acknowledges the generous sponsorship and support it is receiving from Defence Science and Technology Group (DSTG) and CSIRO Data61 for the 2016 National Conference. ASOR is pleased to be once again joining with the MODSIM conference in 2017. This will be held in early December 2017 in Tasmania. The conference website is at http://www.mssanz.org.au/modsim2017/. As alerted earlier in August via the email list, ASOR will be awarding the Ren Potts medal and Rising Star Award again in 2016. Nominations are currently open, and will close at the end of September. See ASOR Ren Potts Medal and ASOR Rising Star Award for further information. Robert Burdett (Chairperson ASOR-Qld 2016), on behalf of ASOR, is pleased to invite members and non-members to attend our workshop on Health Care Planning and Operational Research. The one day workshop will be held on Friday the 7th of October at the Queensland Treasury Casino from 8.30am to 5pm. Morning and afternoon tea and lunch will be provided. We expect everyone who attends this workshop will receive value from the program and will enjoy the atmosphere and surroundings of this first class venue. If you have any queries please don’t hesitate to contact Robert. 1 Post-Doctoral Fellow and 2 PhDs required, Monash University, Melbourne. Storage at the inland terminals as well as scheduling of loading and unloading operations. At the strategic level, choices need to be made regarding capital investment decisions relating to truck fleet size, railing capacities, equipment for handling containers at the terminals and storage capacities. Operating this transport infrastructure in a synchromodal manner requires adaptively making decisions on timing, mode choice and route choice of container movements. Container movements are restricted by release times and due dates, that is time windows between which they must be picked up and delivered. These time windows are typically determined by customers and shipping companies and subject to change. The travel times of trucks are also likely to vary significantly during periods of congestion. Hence the need for an adaptive, synchromodal operating mode. The project requires one Post-Doctoral Fellow and two Doctoral (PhD) students working on specific aspects of the overall problem. Recent Advances was held on 31 March and 1 April 2016, at the School of Mathematical Sciences, Monash University Clayton Campus (see Recent Advances 2016 for more info). We had two full days of presentations, as well as a welcome reception and the ASOR National AGM. Data61's Alban Grestian presenting at ASOR Recent Advances 2016, on 1 April, about diagnosis in planning and scheduling. MAXIMA @Monash and CSIRO Data61 provided in-kind support and significant funding for the event, and this assistance and partnership is very much appreciated by ASOR. The Melbourne chapter of ASOR, including representation from South Australia and Newcastle, will hold its Annual General Meeting on 16 March 2016, 3:30pm, in Room 7.84 of Building H at Monash University Caulfield Campus. Attendance by teleconference will be facilitated. At the AGM we will present annual reports and also hold elections for 2016 office bearers. The AGM will be followed at 4pm by a seminar by Yury Kryvasheyeu from CSIRO Data61. are directly observable through the intensity and composition of Twitter’s message stream. We demonstrate that per-capita Twitter activity strongly correlates with the per-capita economic damage inflicted by the hurricane. We verify our findings for a wide range of disasters and suggest that massive online social networks can be used for rapid assessment of damage caused by a large-scale disaster. ASOR Melbourne encourages its members to nominate for the 2016 ASOR Melbourne Committee. Get involved and make a difference to your OR & Analytics commercial, industrial and R&D community. We are seeking nominations for the office bearer positions (President, Vice President, Treasurer, Secretary), representative positions (DSTG Representative, SA Representative, Newcastle Representative, Student Representative), and general committee positions. ASOR is proud to announce that at the first day of the ASOR/MODSIM/DORS 2015 conference on 30 November, we awarded Ren Potts medals to Erhan Kozan and to Phil Howlett, and the ASOR Rising Star Award to Hassan Hijazi. Congratulations to these three extremely worthy winners. Citations for Erhan and Phil can be found at ASOR Ren Potts Medal, and Hassan at ASOR Rising Star Award. If you're into twitter keep up with the hashtags #ASOR and #MODSIM2015. The final program for ASOR/MODSIM/DORS 2015 can be found at the MODSIM 2015 website. Nominations close on 30 September 2015, and the awards will be presented at the ASOR/MODSIM/DORS conference in December. Successful scholarship applicants will be supervised by at least one NICTA affiliated academic staff member from the Faculty of Information Technology. ASOR ACT Chapter calls for nominees for the best Operations Research (OR) Postgraduate Research Award 2015. The award aims to encourage and reward students for excellence in the OR field, and provides a forum for students to share their academic excellence and research findings. See http://asor.org.au/files/ACT_Student_Award.pdf for more information. Nominations close 7 September 2015. The Science Foundation of Evidence-Based Policy and Decision Making, an ASOR Canberra seminar by Dr Alex Zelinsky (Chief Defence Scientist). Degeneracy - Design Principle for Adaptable and Robust Complex Systems, an ASOR Wednesday seminar by Dr Axel Bender (DSTO) presenting from University of South Australia, Mawson Lakes on 20 May 2015. The ASOR National Conference 2015 is embedded within MODSIM 2015 on the Gold Coast, 29 November to 4 December 2015. Submission of Full Papers or Extended Abstracts was due on 31 July 2015. Authors should expect peer reviews to be communicated to them in early September, and final versions of papers must be ready by 2 October to enable printing for the conference as well as for indexing by ISI. Earlybird registration closes on 28 August, and the price rises by over $100 for standard registrations. ASOR will hold its Annual General Meeting for 2015 during ASOR/MODSIM/DORS 2015 on the Gold Coast. President's Reports, for 2013 and 2014, have been posted at ASOR Annual Reports. ASOR's plan for standalone and joint conferences in 2014, 2015 and 2016. A review of IFORS Barcelona, by Ian Monks. Rob Burdett: An Integrated Approach for Earthwork Allocation, Sequencing and Routing (15 Sep in Qld). Changes in the ASOR National Executive. A call for nominees for the ASOR Rising Star award (due 30/9) and ASOR Bulletin co-editors. Summer school, conference and job announcements.